One of the more popular shows the UFC has produced has been Dana White’s Lookin’ For a Fight series, in which White, Matt Serra, and Din Thomas travel the world visiting regional promotions and looking for the next fighter to sign to the UFC. In the most recent season, White used the series to find prospects that he could add to the Tuesday Night Contender Series as a way to give fighters their chance to earn a UFC contract. The Lookin’ For a Fight series has helped the UFC sign the likes of Jared Gordon, Bobby Moffett, Sage Northcutt, Mickey Gall, just to name a few. 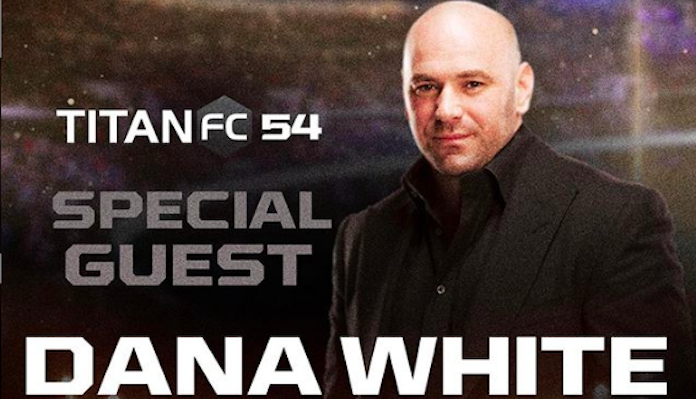 The show will return the night before UFC Ft. Lauderdale when Dana White and his crew will be special guests for Titan FC 54, which will be headlined by undefeated featherweight champion Jason Soares looking to defend his title against Anderson Hutchinson. In his most recent victory at Titan FC 52 against Caio Urugual, Soraes got on the microphone following his fight and shouted out his phone number to Dana White telling him to call him and give him a shot in the UFC, and it appears White is ready to give Soares a chance. Titan FC CEO Lex McMahon released a statement regarding the news that White will be in attendance at the next show. Titan FC 54 will take place on April 26th, just one day before UFC Ft. Lauderdale is scheduled to take place. Yoel Romero will take on Jacare Souza in the UFC Ft. Lauderdale main event.